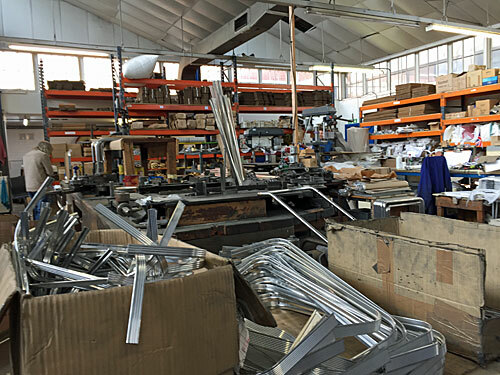 Kaymet are "a maker of trays and trolleys since 1947", whose south London factory flung wide its doors over the weekend for anyone to look around. That's the kind of Open House offer I find hard to resist, so I headed down the Old Kent Road to track the metalworkers down. Their factory's at the end of Ossory Road, a light industrial dead end (with evangelical infill) backing onto an Asda superstore. Turn left at the stonemasons, walk past the tiny hut doubling up as a showroom, and here is a small business doing what small businesses do best. The building's the seventh Kaymet has inhabited over the years, and nothing special, merely a large functional shed seemingly haphazardly laid out. But the product which emerges at the end of the line is premium stuff, sold in Harrods and John Lewis, and fundamentally the same design which first emerged in 1947 and was exhibited at the Festival of Britain. The handles are attached more efficiently these days, and the range of colours is a more recent diversion, but the benchmark tray is still made by thwacking a sheet of aluminium in a big press, then hand-finishing the edges and anodising the result. Kaymet started up under a German owner, surname changed for postwar anonymity, and his son still helps out with day to day operations. But the current owner of the business is an escapee from City Hall whose department disappeared under Boris, and who couldn't bear to see a long-standing local business slide into liquidation. He and his wife are now more deeply involved in day-to-day operations than they ever expected, and mesmerisingly enthusiastic too, which made the tour an especially engaging half hour. 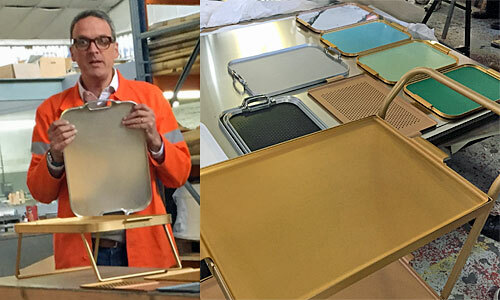 It was a privilege to wander amongst the workbenches, machinery and boxes of frames, and to learn the 'trade secret' of how they punch through the rubber squares that make the non-slip trays non-slip. It's reassuring to know that some of London's manufacturing industry survives, indeed Kaymet have discovered that 'Made in London' still resonates with luxury foreign markets. What's less reassuring are the relentless economic pressures on land in inner London, which mean that small-time manufacturing has a tendency to metamorphose into flats. The Old Kent Road is under particular pressure on this front. Over 800 small businesses in the immediate area provide work for around 10000 people, but various Southwark Council redevelopment plans loom large on the gentrification drawing board. The Bakerloo line extension, if it ever happens, will plonk two new tube stations either side of Ossory Road, and tomorrow's Londoners want accommodation more than they want trays. Tucked away in an old printworks in a backstreet near West Norwood station is a unique collection of mechanical timepieces. Most horologists tend to collect wind-up antiques or intricate watches, but James Nye has a passion for the electro-mechanical, and had long been searching for somewhere to keep them. 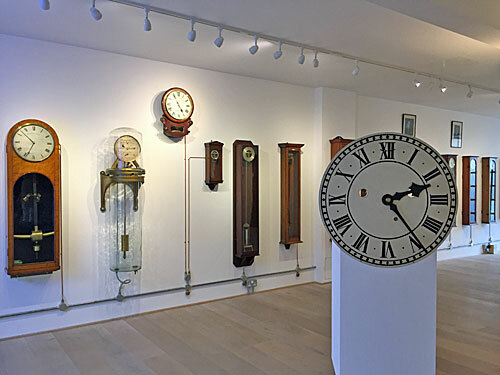 The ground floor of this post-industrial building proved ideal, and his clocks now have collective life rather than being stashed away where hardly anyone ever sees them. Electro-magnetic clocks are pulse-driven, some with an internal oscillator and others a pendulum. They were often used in institutions where it was important to have a network of clocks all telling the same time, for example in an office, hospital or school. The master clock would be maintained at the correct time and a series of slave clocks would be connected by wires to run synchronously elsewhere. 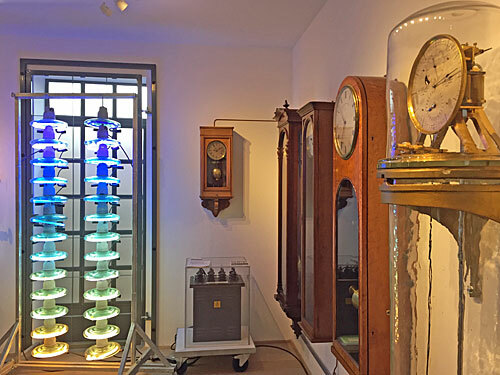 Most of James's clocks are the masters, and have the look of a long-case timepiece about them, while other exhibits include regulators used for the very precise timing of astronomical observations. The Clockworks exists not just as a museum but as a conservation workshop. A raised concrete platform at the rear of the floor proved ideal for the installation of tools and benches, and more importantly provides somewhere for horology graduates to continue to practice after completing their degree. Several apprentices (from West Dean and Birmingham) have worked here over the last five years, maintaining the collection two days a week and practising the art of conservation on the others. If you have any kind of vintage clock or watch which might need repairing or bringing back to life, hold this place in mind. It's a lovely mixed-use space, with a small library up front and various historical oddities scattered elsewhere. Dr James is a twinkly and engaging curator, as befits the chairman of the Antiquarian Horological Society, while the apprentice I spoke to was equally cheerful, dedicated and keen. I suspect my lengthy Open House visit merely scratched the surface of all there is to know about the world of distributed timekeeping. Thankfully the collection's also open 'by appointment', particularly if you have a small group you'd like to bring round, should you too ever fancy a fascinating insight into what makes these things tick.